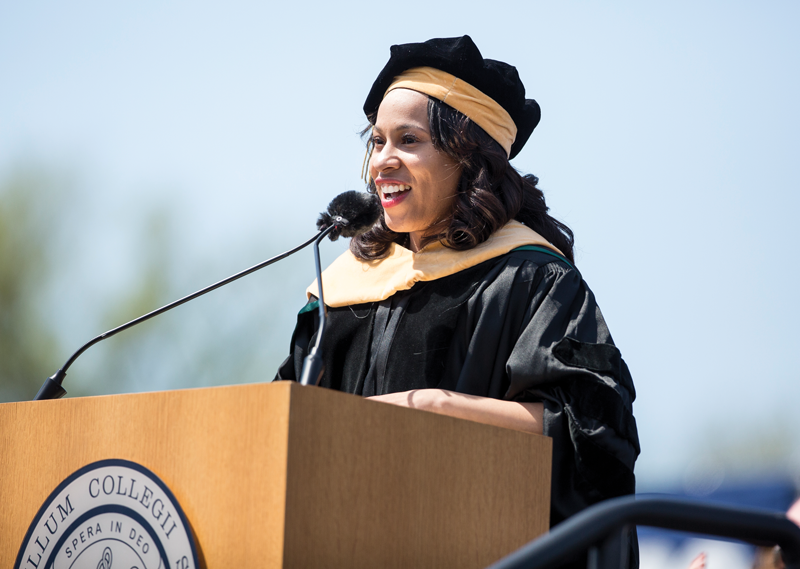 As she delivered her Commencement address to the graduating Class of 2018 on May 6, Dr. Temple Smith, assistant professor of sociology, explained that she had considered a variety of approaches for framing her remarks. Front-running possibilities had included exploring The Game of Life board game, the words of Oprah Winfrey and the collected wisdom of her academic discipline. However, she said, in the end none of them were quite right, and she looked back several centuries for her address “Chosen: So This is Hope” and started with 1 Peter 2:9. Just as the passage references a people chosen by God, she observed that the graduates, too, were chosen — each for a path his or her own. She noted that following calling won’t always be easy. For the difficult times, she encouraged the graduates to remember the inspiration for their alma mater’s name and its origin in Scripture. The Commencement ceremony was preceded by the college’s Baccalaureate services, which featured the sermon “(You’ll) Never Be Lost,” by Dr. Gerald Griffin, assistant professor of psychology and biology. “When we start switching THE (singular) truth for OUR ‘truths’ — when we start regarding ourselves and other created things as the source of universal truth, THE source of love, it is at this moment that we start getting lost,” he said.